A significant choice between numerous binary options brokers is generally a good thing for traders. Competition means both a general improvement in quality as brokers compete for clients and also a breadth of choice when it comes to trading platform qualities and characteristics, tradable instruments range and other consideration such as banking. However, it also means that the amount of information that traders have to wade through in order to make a choice of broker is significant with so many to assess. We’ve tried to take at least some of that load off the shoulders of traders in this binary options review section by summarizing key information on the main consideration that traders have such as a broker’s trading software, company background and business model, regulatory status, customer service and more. We hope you find it useful! 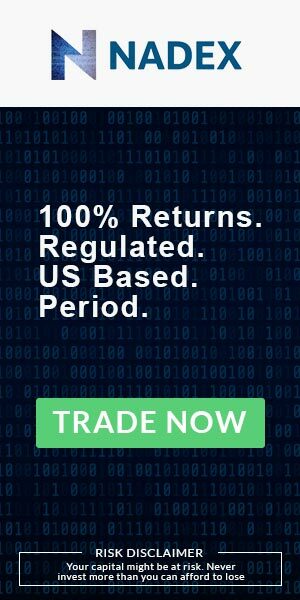 In the particular review we take a look at Nadex, as far as we know, the only retail-facing binary options broker offering the same product professional traders work with and domiciled and regulated in the U.S.A.
Nadex, or North American Derivatives Exchange, was founded in 2004 as the North American unit of IG group, the FTSE 250-listed British broker established in 1974 and the UK’s market leader in retail financial derivatives trading. Nadex is regulated by the U.S. Commodity Futures Trading Commission (CFTC) and is also a member of several major U.S. exchanges. It is arguably (though the argument is fairly watertight) the most tightly regulated binary options broker in the world and brings a truly professional binary options product to the retail trading market. Nadex is one of the only binary options brokers that can work with U.S. citizens, though traders from most other countries internationally are also able to open an account. When it comes to client safety there are also few brokers that can rival Nadex with strict capitalization requirements enforced by the CFTC and client funds segregated and held in accounts with top tier U.S. banks. 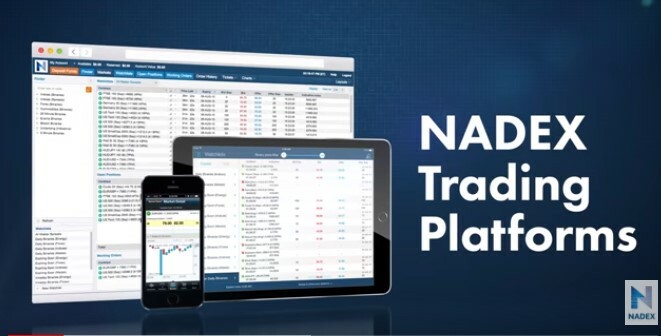 Nadex’s trading software much more closely resembles professional trading platforms than the average binary options trading platforms. It provides for far greater depth of functionalities and in-trade control than usual and does look a little more old-fashioned than other platforms when it comes to design. However, traders should not be put off and because binary options, even the professional version offered by Nadex, are by nature a simple financial derivative, a relatively small amount of perseverance will result in quickly getting to grips with the main functionalities and being able to place and manage trades. The desktop trading platform is browser-based and synced with the app version so trades can be made on one and then managed on the other with no interruption or loss of information. The mobile app version of the trading platform looks a lot more contemporary than the desktop version and as a result some traders may feel more at home exclusively using the app. As well as native iPhone and Android apps, there are also apps made specifically for tablets, to make optimal use of the larger screen. It’s probably fair to say that the mobile app versions of the trading platform are superior to the desktop version if only in the sense that they will be a lot more familiar to most retail traders in terms of contemporary design and UX. The apps are very nicely designed and optimise touch-screen technology in the charting package, allowing the drawing and annotation of technical indicators within the charting package. Namex offers traders a huge range of over 2000 tradable instruments across forex (including cryptocurrencies), commodities, equities indices and events such as economic data readings on statistics like Non-farm payrolls. Individual company stocks are unfortunately not available to trade but the huge depth available in other markets more than compensates for this. The key feature of Nadex’s business model is that the broker is genuinely a broker rather than a market maker like the vast majority of binary options ‘brokers’. Price quotes come directly from the market (DMA) and Nadex has no interest in the trader’s position, making money on a small commission of $1 on the entry and exit of every binary option contract opened, up to a ceiling of $50 on larger positions. Because the binary options are DMA traders are free to close a position whenever they like, selling it back to the market to lock-in profit or cut an expected loss. The option is not locked-in until its expiry as is generally the case with the usual simplified binary options product available to retail traders. Payout levels have no minimum or maximum and are entirely based on how confident the underlying market is as to whether the trader’s position will finish in or out of the money. The less confident the market is in the trader’s chances, the higher the payout that will be offered. The only fees charged by Nadex, excluding its $1 charge per contract on both sides of a trade opening and expiring, is a $25 charge on account withdrawals made by wire transfer. Withdrawals to a debit card are not charged. Nadex’s CFTC-regulation means that it is not permitted to offer any kind of bonus program to traders as this is considered as enticement into a risk-based financial derivatives investment. Nadex facilitates bank transfers (for U.S. bank accounts) wire transfer (for non-U.S. bank accounts) and debit card transactions for both deposits and withdrawals. Deposits can also be made via cheque, though not withdrawals. Credit card payments are not accepted under CFTC-regulation and e-payment processors are also not yet supported. The minimum deposit is $250 with no minimum withdrawal level. Telephone (toll-free within the U.S.) is the primary customer support channel available to Nadex traders and email is also an option. At present, there is no live chat customer support facility. Customer support service hours are 11:00 ET Sunday through to 17:00 ET Friday and support is currently exclusively offered in English. As already mentioned, the two unique features for traders using Nadex is that the broker operated a DMA model and has no financial interest in the success or failure of a binary options position held by its clients. Traders can also close binary options at any point they choose prior to their expiry date on the terms the underlying market is willing to offer at that point. An extensive resource of educational materials in video and text format is also available, as are detailed tutorials on the use of the desktop and mobile versions of the trading platform. 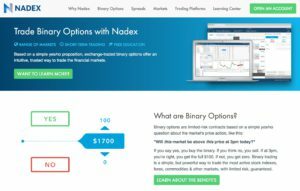 For serious traders looking for a retail-facing professional-level binary options product that is a genuine derivative rather than simply approximately mirroring derivatives trading, Nadex is probably the best option available on the market. The DMA-business model and U.S. regulation makes this probably the safest and most transparent binary options broker on the market currently. Complete beginners to financial markets trading will find the Nadex trading platform more complex than the average but those who are serious about trading would be advised to put the additional effort in. The desktop version of the software could do with a bit of modernisation but the mobile apps are first class. Old-fashioned look to desktop trading platform. Is trading with Nadex safe? Regulated in the U.S. by the CFTC, Nadex is arguably under the strictest regulatory regime of any binary options broker in the world. Parent company is FTSE 250-listed IG Group, the UK’s largest retail-facing broker. What is the minimum deposit to open a Nadex Account? What does it mean that Nadex is DMA broker? It means that Nadex simply matches traders with the underlying market and quotes on binary option contracts and payouts are decided by the market. The broker has no financial interest whatsoever in the success or failure of a trade made via its platform and makes money only on the commission charged. This adds a level of transparency for traders.